It is a young theatre with a long history. The plans for building a new theatre ran parallel to the plans for a new city hall. The first discussions held by the Amsterdam city council about building a new city hall and opera house go back to 1915. At that time, the plans were specifically for an opera house, since ballet was a relatively unknown art form back then. Following several previous drafts, engineer Bijvoet (associated with Holt architects from 1948) was commissioned in 1956 to design an opera house. In 1961, he had to ‘move’ the design to the Ferdinand Bolstraat. Despite the city council’s approval of the plans in 1967, the project had reached an impasse at the end of the 1970s, until in 1979 the architect Holzbauer proposed that the city hall and opera house could be combined in one complex. The Council took up this idea and put it to the government of the day. The response was positive and so it was decided to pursue the idea further. It had already been agreed that the Dutch National Ballet would also be one of the resident companies of the new theatre, alongside De Nederlandse Opera. The City Council approved the design in 1980, and this was soon followed by approval from the Provincial Executive for Noord-Holland and the Crown in 1981. The Amsterdam Music Theatre was officially opened on 23 September 1986. The Theater an der Wien was completed in 1801. It has hosted the premieres of many celebrated works of theatre, opera, and symphonic music. Since 2006, it has served primarily as an opera house, hosting its own company. The theatre was the brainchild of the Viennese theatrical impresario Emanuel Schikaneder, who is best known as Mozart’s librettist and collaborator on the opera The Magic Flute (1791). From 1945 to 1955, it was one of the temporary homes of the Vienna State Opera, whose own building had been destroyed by Allied bombing during World War II. However, in 1955, the theatre was closed for safety reasons. It languished unused for several years, and by the early 1960s, the threat had emerged that it would be converted to a parking garage. 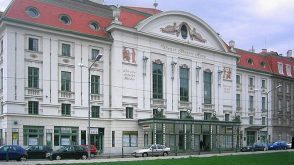 Despite its focus on operettas and musicals, the theatre still served as a venue for occasional opera productions, especially during the Vienna Festival seasons, and sometimes co-produced with the Vienna State Opera. In 1695 Gio Paolo Bombarda, banker and financial counsellor to Maximilian II Emmanuel of Bavaria, decided to build a public theatre for opera, theatre and ballet performances. The construction began in 1700 by architects Paolo and Pietro Bezzi. 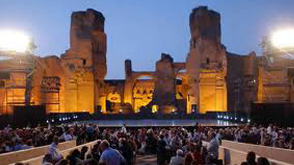 It was considered one of the most beautiful theatres outside Italy. 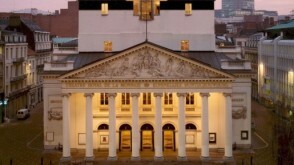 In 1800 Napoleon decided to build a new theatre which was inaugurated in 1819, with a design by Louise Damesme. In 1854 Eugène Simonis put the finishing touch to the façade in the form of a pediment with a bas-relief representing ‘The Harmony of Human Passions’. A dark-blue enamelled, plate steel ‘frieze’ serves to emphasize the top two floors and is a post-modern touch added during the renovation works carried out in 1985-86 after the theatre was destroyed by fire. Two more renovation works were done in 1876 and 1985. Repertoire was restricted to Opera and dance in 1853. La Monnaie became a national institution, having first been run as a private concession and then by the City of Brussels. Königsplatz is a square in Munich, Germany. Built in the style of European Neo-Classicism in the 19th century, it is a center of cultural life. The area around Königsplatz is today the home to the Kunstareal, Munich’s gallery and museum quarter. In the Rambla of Barcelona stands the Gran Teatre del Liceu. Its construction was funded by Catalan businessmen, when it opened in 1847, and all kinds of shows were staged there. Then, it began concentrating on opera, dance and concerts. 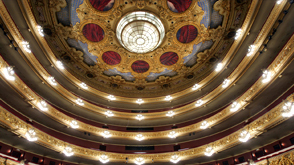 The Liceu has been the mainspring of social and cultural life in Barcelona. to improve the technical facilities and enhance the level of comfort; to reinforce its status as a public-service institution; to reproduce the decoration of the auditorium as it was prior to the fire. The auditorium preserved its horse-shoe-shaped layout. Its stalls and its five galleries. With seating for 2292 people, it is one of the largest Opera House in the world. The stage is equipped with the very latest technology and can be adapted to all kinds of operatic productions. 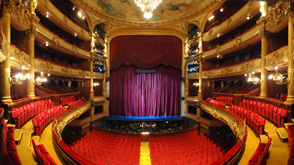 From the seats of the Liceu the audience can enjoy the very finest operas, performances by the most distinguished dance companies, concerts and recitals by the world’s leading artists. The Liceu offers culture for everyone. And now, from the cinemas as well. Welcome to the Gran Teatre del Liceu. The history of Zurich Opera House begins with the “Actien-Theater” (shares theatre), which opened in 1834 with Mozart’s “Zauberflöte”. Zurich’s first permanent theatre, it was established in the form of a joint stock company by theatre-loving citizens. The joint stock company (today known as Opernhaus Zürich AG) still runs the institution, and celebrated its 175th anniversary in 2009. The Canton of Zurich has been the main subsidiser since 1995. The old “Actien-Theater” burnt down in 1890 and was replaced by a new building designed by Fellner and Helmer. This theatre, located not far from Bellevue on Lake Zurich, was financed almost entirely by private means. It was inaugurated with Wagner’s “Lohengrin” under the name of “Stadttheater” (town theatre) in 1891. Musical theatre and drama have gone their separate ways in Zurich since 1921. The old “Stadttheater” has been known as the Opera House since 1964. Now with a seating capacity for approximately 1,100, the theatre was renovated entirely between 1982 and 1984, and an extension was added on Uto-Quai to accommodate a second, studio stage. In 1985 the opera orchestra was separated from the Tonhalle Orchestra, thus bringing the Zurich Opera Orchestra into being. Zurich Opera has had its own baroque ensemble (“La Scintilla”) since 1995, formed by members of the opera orchestra. 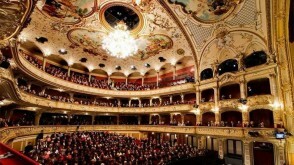 With a capacity of 2,500 seats, the Festival Hall Baden-Baden is one of the largest classical music venues in Europe. 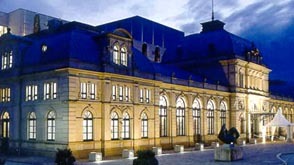 The building features a unique architecture as the opera hall sits on the trackbed of a former railway station, whose neo-classicist structure serves as the entrance hall of the Festival Hall Baden-Baden. The reconstructed opera house was designed by the Viennese architect Wilhelm Holzbauer in the mid-1990’s in accordance with ideal acoustic values calculated by the acclaimed Munich-based physicist Karlheinz Müller. In 1776, under the auspices of Empress Maria Theresa, construction began on the buliding that was to become the greatest opera house in history. 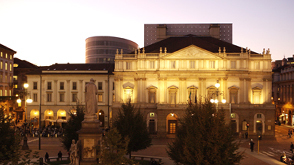 Two years later, in 1778 the Teatro Alla Scala was inaugurated with Antonio Salieri’s Europa. Verdi, Donizetti, Rossini and Puccini premiered their greatest Operas at La Scala. Today, La Scala is widely recognized as the ultimate challenge for the world’s greatest Opera virtuosos because of its passionate audiences, who always demand absolute perfection. When Luciano Pavarotti missed hitting a note perfectly in one performance, he was booed – he later said that the audience was right – he had made a mistake. 234 Years after its opening, La Scala’s magic can finally be experienced without travelling all the way to Italy. 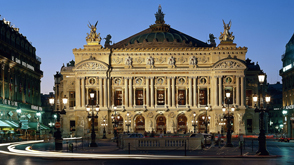 The Opera de Paris is the primary opera and ballet company of France. Founded in 1669 by Louis XIV as the Académie d’Opéra or Opéra, it was shortly after placed under the leadership of Jean-Baptiste Lully and officially renamed the Académie Royale de Musique. Classical ballet as it is known today arose within the Paris Opera as the Paris Opera Ballet and has remained an integral and important part of the company. Currently called the Opéra National de Paris, it mainly produces operas at its modern 2700-seat theatre Opéra Bastille which opened in 1989, and ballets and some classical operas at the older 1970-seat Palais Garnier which opened in 1875. Created by the architect Charles Garnier in 1875, the Palais Garnier houses a prestigious auditorium and public areas (grand foyer, rotonde des abonnés, salons), a museum-library, as well as several rehearsal studios and workshops. The “Italian-style” auditorium, with its ceiling painted in 1964 by Marc Chagall, can accommodate 2054 spectators. With nearly 480,000 visitors each year, it is one of Paris’ most visited monuments. It has been listed as a historical monument since 1923. Inaugurated in 1989, the modern Opéra Bastille, designed by Carlos Ott, houses a main auditorium with 2745 seats, a 500-seat amphitheatre, a 230-seat studio theatre, set and costumes workshops and offices. Small scale and contemporary works are also staged in it. The Salzburg Festival was inaugurated on August 22, 1920, when Hugo von Hofmannsthal’s morality play Jedermann was premiered on the Domplatz, directed by Max Reinhardt. 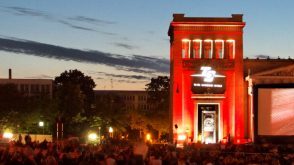 Initially the festival idea was based on the desire to establish outstanding artistic events of the highest standard in a close relationship with the cultural tradition of Austria, to the genius loci of a Baroque city. Thanks to the international charisma of the artists Max Reinhardt brought to Salzburg, and the visions of the founding fathers, the Salzburg Festival very quickly became a world attraction. Since that time, the Salzburg Festival has established itself as the most important festival for opera, drama and concerts. It has become stylized as “the heart of the heart of Europe” and has always been place to explore new visionary concepts. 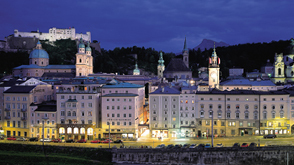 The 2010 season celebrated the 90-year anniversary of the Salzburg Festival. From 2012 onwards, the directorate will consist of Alexander Pereira as Artistic Director and Helga Rabl-Stadler. On May 25, 1869, the opera house solemnly opened with Mozart’s DON JUAN in the presence of Emperor Franz Joseph and Empress Elisabeth. The popularity of the building grew under the artistic influence of the first directors but it experienced its first high point under the direction of Gustav Mahler. He completely transformed the outdated performance system, increased the precision and timing of the performances, and also utilized the experience of other noteworthy artists, such as Alfred Roller, for the formation of new stage aesthetics. On March 12, 1945, the opera house was devastated during a bombing. For the next ten years the Vienna State Opera operated in two venues while the true headquarters was being rebuilt at a great expense. Only the main facade, the grand staircase, and the Schwind Foyer had been spared from the bombs. On November 5, 1955, the Vienna State Opera reopened with a new auditorium and modernized technology. Under the direction of Karl Böhm, Beethoven’s FIDELIO was brilliantly performed, and the opening ceremonies were broadcast by Austrian television. The whole world understood that life was beginning again for this country that had just regained its independence. Once a year, the Vienna State Opera is transformed into the most festive and most famous ballroom in the world – the Vienna Opera Ball. This unique festival is always the undisputed pinnacle of the ball season in Vienna, as is proven by its enormous international appeal. Experiencing a performance at the former Königliche Hofoper not only means enjoying the traditionally excellent conducting and ensemble, but also a visit to one of the world’s most beautiful opera houses. The “Enchanted Castle” was commissioned by Frederick II from his friend the architect Georg Wenzeslaus von Knobelsdorff. Construction began in July 1741 on what was intended to be the first part of a Forum Fredericianum. A full ten months before its actual completion the monarch’s impatience precipitated the opening of the Hofoper with a performance of Carl Heinrich Graun’s »Cleopatra e Cesare« on December 7th 1742. This event marked the beginning of the successful 250-year-old cooperation between the Staatsoper and Staatskapelle. 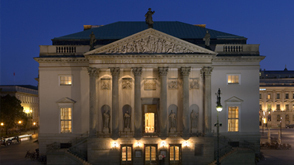 The Staatsoper Unter den Linden has a unique programme of concerts and operas, which ranges from Baroque operas in historical performance practice to the central works of the classical, romantic and modern opera literature to the realisation of premieres by contemporary composers. 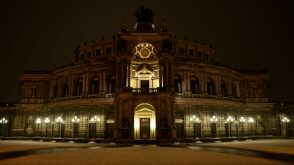 The performances are of the highest musical quality, something guaranteed by the presence of Daniel Barenboim as the general music director and by renowned guest conductors, a house ensemble of first-rate singers augmented by internationally known stars, and, not least, by the Berlin Staatskapelle. The productions reflect a commitment to these works from a modern perspective; they challenge conventional viewing habits, while remaining true to the spirit of the work. 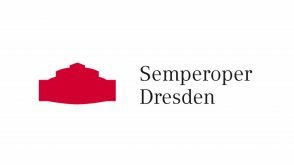 During the urgently necessary renovation of the entire Staatsoper Unter den Linden, which began in 2010, the Schiller Theater in Berlin-Charlottenburg will serve the ensemble as an alternative venue from October 2010 until summer 2014. The repertoire will be performed there with the same commitment high artistic standard as in Berlin-Mitte. 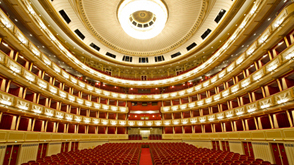 The Teatro Real in Madrid is considered to be the top institution in the country in the music and performing arts field. On January 7, 1817, King Ferdinand VII ordered an opera house to be built on the Plaza de Oriente. 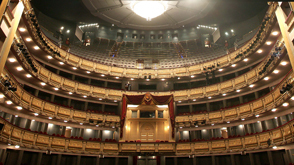 The first stone was laid for the construction of the Teatro Real on April 23, 1818. The theatre was renamed Teatro Nacional de la Ópera after the Glorious Revolution of 1868. In October 1925, subsiding in the building forced the theatre to be closed and a 41-year period of repairs ensued without the building opening again. The Civil War (a powder keg exploded inside the building) and hardships during the postwar years made reconstruction even more difficult and everything came to a standstill. In 1966, the building opened to the public both as an auditorium and the offices of the Real Conservatorio de Música y Escuela de Arte Drámatico. The last concert by the Orquesta Nacional, seated here, was on October 13, 1988. From 1966 to 1988 the Teatro Real was the main concert venue in Madrid, but the need for a proper opera house led to the conversion of the building into an opera house, which began on January 2, 1991. This time the renovations lasted nearly 7 years. The opening included the performance of Manuel de Falla’s opera La Vida Breve and the ballet El Sombrero de tres picos. In 2017, the Teatro Real celebrated the 20th anniversary of its reopening (1997-2017). In the course of a single season, over 40 operas from four centuries are performed along with ballets, concerts and song recitals. 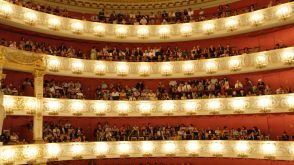 This makes the programme of the Bayerische Staatsoper one of the most richly varied performance schedules of all the international opera houses. One year after the end of the Second World War, the first Bregenz Festival was held: the week-long Bregenz Festwoche. The inaugural performance was staged upon two barges moored on Lake Constance – one carrying the stage structures for Mozart’s early work Bastien et Bastienne, the other the orchestra. In a town that did not even possess a theatre, the idea of mounting a festival seemed eccentric; but the initially makeshift solution of choosing the loveliest part of the town – the lake – as the stage proved to be a hugely successful one. Visitors from Austria, Germany, Switzerland and France made the Festival an international event in its very first year. 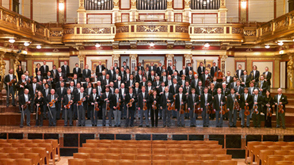 The Festival orchestra from the outset was the Vienna Symphony Orchestra, which has made a major contribution to the evolution and success of the Festival. Thanks to strong public interest, the Festival became longer each year and its program became more varied. To accommodate the growing audience, the stage and festival house have been refurbished and enlarged over the years. 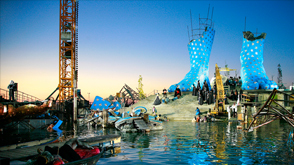 The Bregenz Festival made its debut on the cinema screen in the Bond movie Quantum of Solace. The Opera has been incorporated intriguingly into the action of the film: the chase through the Festspielhaus is at the end like an apocalyptic silent film – interspersed with dramatic scenes from the Bregenz Tosca. In 2010 Aida had attracted the biggest number of spectators to the Seebühne stage in the festival’s history and it is now available on the big screen, this time in full length. 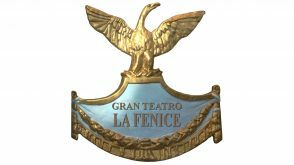 Founded in 1792, the Teatro La Fenice staged during the XIXth century the world premieres of numerous operas, including Rossini’s Tancredi, Bellini’s I Capuleti e i Montecchi, Donizetti’s Belisario, and Verdi’s Ernani, Rigoletto, or La Traviata. In the last century, the Fenice has also placed a special emphasis on contemporary productions, with a seating capacity for over one thousand people, the Fenice boasts excellent acoustics (which were improved when the theatre was rebuilt after the devastating fire of 1996), a 98-member orchestra and 66-person opera chorus, a dedicated local audience and a large international following. The theatre is a leading creative venue, staging more than one hundred opera performances per year, a major symphonic season conducted by prominent conductors from across the globe (including frequent collaborations with Myung-Whun Chung, Riccardo Chailly, Jeffrey Tate, Vladimir Temirkanov and Dmitrij Kitajenko), the full cycles of symphonies by Beethoven, Schumann, Brahms and Mahler, a contemporary repertoire focused especially on Venetian artists such as Nono and Maderna, ballets, and chamber music concerts. Founded in 1967, the Opéra Royal de Wallonie in Liège is situated on the border between France, Luxembourg, the Netherlands and Germany. Due to its geographical location and its high-quality scheduling, it attracts a demanding, and increasingly large, international audience. 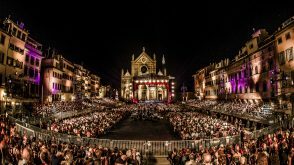 Its reputation is constantly growing too, thus attracting internationally renowned artists and prestigious conductors: Ruggero Raimondi, Juan Diego Florez, José Cura, Rolando Villazon, James Morris, José Van Dam, Patrizia Ciofi, Marianna Cornetti, Simone Alaimo, Daniele Gatti, Riccardo Muti, Claudio Scimone, Paolo Arrivabeni – currently Musical Director –, Alberto Zedda and Patrick Davin, to name but a few. 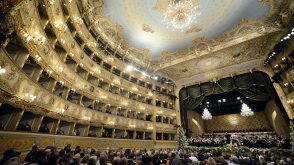 In its scheduling, Italy, the cradle of opera, occupies a choice position. Works stemming from the 19th century repertoire (with Verdi and Puccini topping the bill) occupy a major place on the schedule, but its vocation of discovery also pushes the Opéra Royal de Liège towards the lesser known repertoire of the 18th century, with composers such as Cherubini, Cimarosa and Grétry. 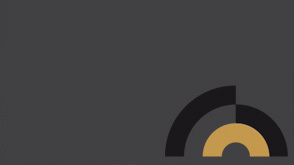 The Opéra Royal de Liège also tackles demanding operas such as Der Ring des Nibelungen in its entirety, Mefistofele, Samson et Dalila, Messa da Requiem, Lucrezia Borgia, Ariadne auf Naxos, Arabella and Boris Godounov. 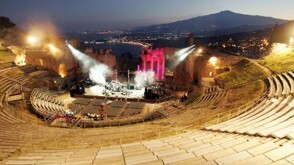 With an impressive orchestra which excels at various operatic styles and a chorus which has mastered a broad repertoire, the institution is recognised unanimously by the audience, the specialist critics and the professional world, recognition which has earned it an invitation to the Baalbeck International Festival and, next July, the Santander International Festival. 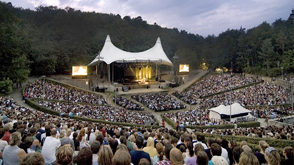 The Waldbühne in Berlin is one of the most appealing outdoor amphitheaters on the European continent. With over 20,000 attendances, these are some of the most popular classical music concerts in the world.